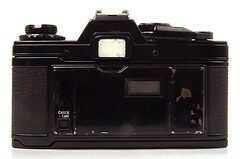 The OM-10 was the first consumer OM series body. Launched in 1979 it accepted the full line of OM lenses and most of the OM accessories for a lower price. The lower price was reflected in the construction of this camera and the features available, however, it was still a very competent performer and it reflected the elegant lines established by the compact OM-1 and 2 designs. 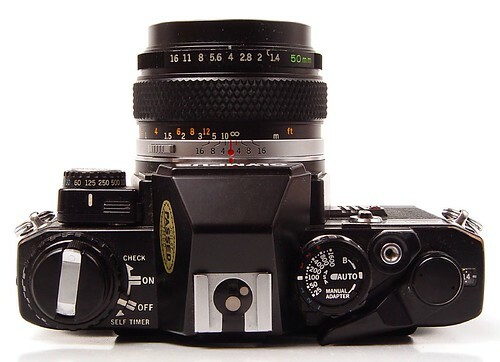 In its standard configuration the OM-10 offered aperture priority (auto) exposure, simple and accurate enough for a consumer camera in most lighting situations. It also offered exposure compensation for more complicated lighting situations and for more advanced users. When you wanted to have a fully manual camera a manual adaptor was available as an accessory. This device simply plugged into the front face of OM-10 and allowed you to use the manual setting of the camera to set the shutter speed. Although the manual adapter works it is not nearly as easy to use as the signature lens throat shutter speed dial on the OM1 thru 4 and the manual adapter has no effect of the OM-10's light meter so it's use is made even more clunky. The original OM-10 was released in a chrome finish and the typical lens that came with the body was the venerable Zuiko 50mm f1.8. In 1980 the OM-10 Quartz was released that had a databack for imprinting the time or date on your prints; very high-tech for its day. 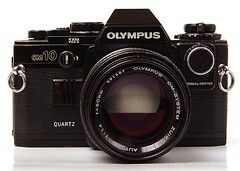 The OM-10 quartz was available in a black finish which the standard OM-10 was not. The OM-10 was sold in large quantities in its day and many working examples are still being used today. Largely overlooked in favor of its more professional 'single digit' siblings you can easily pick up a working example for $50. Try to find one that includes the manual adapter though, as this accessory alone fetches $30 on ebay. Back in my youth I remember the OM-10 in the Argus (UK) catalogue being out of my reach; this was at a time when I bought my Zenit EM from said, same catalogue. When I saw a OM10 kit for sale on CraigsList recently it was primarily the lenses that I was interested in. $90 and a trip to Sausalito bought me a Zuiko 65-200mm f4 (the prize of the package and worth at least the asking price alone), a Zuiko 50mm f1.4 (currently the fastest lens I own), a Vivitar 24mm f2 (to replace an old favorite that has been infected by fungus), a broken 28mm and a black bodied OM-10 quartz. All this stuff had been sitting in a cardboard box in a garage for years but after dropping a pair of fresh batteries into the camera it fired up with no problems. A decade or more of neglect was evident in the deterioration of the foam door seals but show me a camera from that period without that problem. An evening with a toothpick and some replacement foam had the camera light-tight again for little cost. My intention was to sell the camera but it's kind of cute and I haven't been able to part with it yet even though it is far out-classed by my OM-1's and my OM-2spot/program. It is an unassuming, unpretentious well mannered consumer camera that I really have no use for but it takes me back to the early 80's sitting there on my shelf. I have a used Olympus OM-10 which I bought new in 1981. After only a couple of years the light meter quit working. I just never got it fixed, but bought a manual adaptorfor it. I still never had very good luck with photographing with it, as I am strictly an amateur. If I got a really good shot with it, it was pure luck. I am trying to sell it now, as I purchased a used OM-1n. 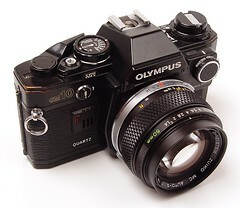 Any idea how much I should ask for the Olympus OM-10 with the manual adaptor and 50 mm lens? Would appreciate any advice. Digital has killed the market. Having just changed from the classic Silver OM10 to an OM10 QUARTZ, I find a little window on the backplate which says 70 1 1, I assume this means year, month and day. How do I change this and the time? Nika - someone asked this above - simply query completed auctions in ebay to see what a chrome OM10 goes for - looking a body is going for $20-40 - with a lens $35-65. There is very little money in film cameras anymore unless they are very collectible.